Inside the gates of Athens' main university, bonfires rage and masked gangs stockpile petrol bombs, broken paving stones and marble hacked from the neoclassical buildings. It's their arsenal for more possible clashes with weary police. But a week into Greece's worst civil unrest in decades - sparked by the police shooting of a teenage boy and then fed by anger at the country's economic unraveling - the rioters' best weapon is arguably the law. They have used, some say abused, a decades-old code that bars police from university campuses. The grounds of the Athens Polytechnic have become a combination of sanctuary and makeshift armory for the bands of young men and women who have left parts of the capital ransacked and smoldering. The self-proclaimed anarchists and revolutionaries based at the Polytechnic have become outnumbered on the streets by more typical demonstrators - such as labor unions and opposition parties - who have called for Greece's increasingly unpopular conservative government to resign. Yet it's the rage and destruction of the masked youths that have become the symbols of the showdown. Nearly every night in the past week, the streets around the Polytechnic become an urban battleground. Riot police emerge through clouds of tear gas and the smoke of flaming barricades. Black-clad youths - their faces covered by masks, scarves and motorbike helmets - hurl petrol bombs over the hulks of torched cars. Late on Saturday night, one pushed a shopping cart full of rocks and chunks of marble to replenish the stocks. Another stumbled into the campus wearing a Spiderman mask. "Stones! We need more stones!" someone bellowed in the dark. One young man, his face hidden behind a bandanna and a hood, began smashing pieces of concrete from one of the university's buildings, lit only by the orange glow of bonfires. "Don't waste the Molotovs, damn it! Use them wisely!" another shouted, his voice hoarse from the tear gas fired by riot police night after night. One man staggered as he came through the gate, retching and with tears streaming down his face. Another rushed up to him, pulling out packs of cotton and cream to soothe the burning. "You took a strong hit tonight. You took one for the cause," he shouted above the din. The demands now are mostly cries against the country's conservative government and the economic hardships faced by many Greeks - particularly young people - as the economy stalls after years of moderate growth. The police know that weapons and rocks are stockpiled in the Polytechnic grounds. But they dare not enter. The image of a tank crashing through the Polytechnic's gates on Nov. 17, 1973, to quell a student uprising against the military dictatorship is known to every Greek. The events have gained near mythical status, and Nov. 17 is a public holiday to mark the deaths of the protesters and the beginning of the end for the 1967-74 junta. The university amnesty law - drafted after the restoration of democracy - is a near airtight ban against police entering university or school campuses across the country. Its stated goal was to safeguard "academic freedom" and other ideals of openness. But for years it also has given radicals a safe haven in which to regroup, rearm and launch hit-and-run attacks during frequent protests. Although the law does allow authorities to enter the campus if a felony is committed, only on rare occasions has the asylum been lifted. "The main reason we have reached this terrible situation for the country and our society is of course because the law is not enforced. ... Laws are voted and flouted," commentator Angelos Stangos said recently in the respected daily Kathimerini. "But legislation must be passed to scrap the so-called university asylum. The free exchange of ideas is not under the slightest threat. Maintaining university asylum simply provides safe haven to vandals and criminal elements. Universities have been turned into safe houses for lawbreakers who use campuses to make petrol bombs and store makeshift weapons." And the campuses themselves have suffered. The Polytechnic, officially called the National Technical University of Athens, is one of Greece's most prestigious universities, founded in 1836 and teaching engineers, architects and scientists. Its main campus is now located outside central Athens, but it retains a facility in the city center that often becomes a stronghold of protesters. The wide hallways of at least one building of the Polytechnic are covered with graffiti. Slogans support imprisoned protesters or condemn the police and the political establishment. Building materials for reconstruction work are used as weapons, pieces of the buildings are chipped away to hurl at police. Greeks have a deep well of tolerance for those who rebel against authority, and generally accept the occasional low-level violence that can break out during demonstrations, such as smashing store windows or torching the occasional car. But the destructive fury unleashed by the fatal police shooting of 15-year-old Alexandros Grigoropoulos on Dec. 6 has deeply shocked many Greeks. Still, police are on the defensive. One visited a burglary scene wearing a coat over his uniform, apparently to avoid attracting attention. Greece's Retailers Association estimated 100 million euros ($135 million) in damage to stores, and predicted 1.5 billion euros ($2 billion) in lost revenue during the peak holiday shopping period. 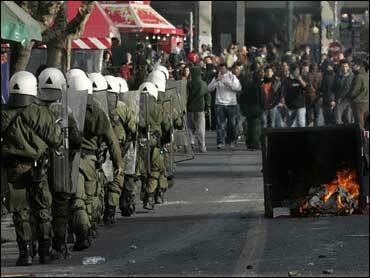 On Monday, about 2,000 youths confronted riot police outside Athens' main police headquarters. Students also gathered outside Athens' main court complex, where four people arrested during last week's riots were ordered to remain in custody. The policeman accused of killing the teenager, meanwhile, has been charged with murder and is being held pending trial. Socialist opposition leader George Papandreou renewed calls Monday for early elections. "The government cannot deal with this crisis," he said. "It cannot protect people - their rights or property - and it cannot identify with the anxiety felt by the younger generation." Prime Minister Costas Karamanlis, whose party has only a single seat majority in parliament, has repeatedly rejected calls to resign, saying the country needed a steady hand in times of crisis.